Tesco are the fifth biggest company on the planet, and as such any green labelling scheme they launch will have a major affect on the environment. As you will see from the "news" section of this website Tesco are constantly in the news. It is easy to loose faith in large companies due to their faceless nature, but as a shopper you vote with you pound / dollar / euro. 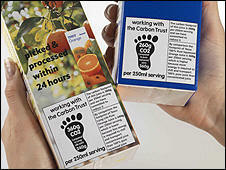 With trials for embodied carbon labelling already under way Tesco is leading the way in the green labelling process. Some examples of the labels that are on the products in store. "We have now labelled 100 products (light bulbs, orange juice, washing detergents and potatoes) with the carbon footprint label, up from 20 when we started in April 2008. In June 08, two months after the launch, we carried out a survey to assess customer understanding of the term ‘carbon footprint’. Over 60% of customers correctly understood the term to mean either "the amount of carbon dioxide produced during a product's life" or "the amount of greenhouse gases such as carbon dioxide we are responsible for". Customers were also asked if they would actively seek to purchase products with a lower carbon footprint and a third said yes and two-thirds said yes if it was cheap/convenient. They were also asked if the label appeared on a high range of products, could it change their 'original' decision to purchase that product and over half said yes. We are also carrying out research with the Sustainable Consumption Institute at Manchester University to help us understand how people interpret and make sense of the carbon labels in relation to other factors affecting purchasing decisions." The foot print trial at Tesco has produced some interesting results, and is already providing insight in to the comparison between similar products.